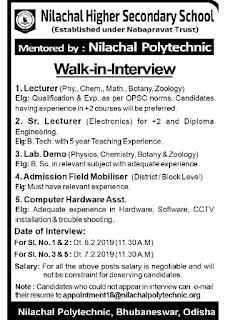 Nilachal Polytechnic,Bhubaneswar,Odisha has advertised for the recruitment of Teaching Faculty- Lecturer,Sr.Lecturer jobs vacancies. 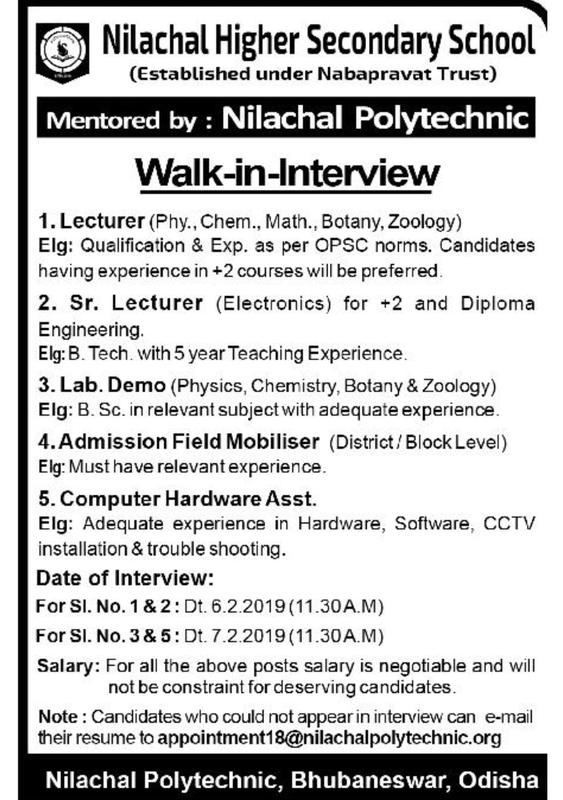 Interested and eligible job aspirants are requested to apply with in 10 days.Check out further more details below. About School:Nilachal Polytechnic, nestling near the foothills of Sikhar Chandi Temple offers an excellent infrastructure and the best learning ambience in the Temple city. The disciplined and pleasant environment of the campus motivates young aspirant to develop their innovative ideas.The campus is technically focused and is following a structured system academic management. The competitive and resourceful environment promotes the students to perform to the best of their abilities.The Institute posses remarkable track record in making the student employable and placing them in reputed organization Nationwide. During its more than a Decade of purposeful journey this Institute has produced good number of Diploma Scholars who are serving the nation to the fullest of their capability bringing name & fame to the Institute. Qualifications & Exp as per OPSC norms. Salary Package: salary is negotiable.It will not be constraint for deserving candidate.